Boys in a school were asked about their favourite participation sports. Listen to the dialogue and choose the most accurate chart. In chart B, half the boys chose baseball; a quarter of the boys chose football; one in four chose basketball. In chart C, a large majority chose baseball; twice as many boys chose basketball as football; only one in ten chose football. Listen to people comparing information about excursions on a holiday in Greece and complete the table. Write no more than 3 words and/or a number in each space. Don't forget to bring your 6.________! 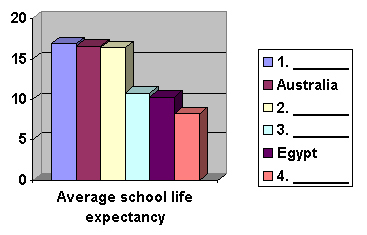 The following chart shows average school life expectancy (i.e. how many years students spend in full-time education) in six different countries. Listen to the talk and label the chart with the correct country from the box below.